What if you could influence $12 billion dollars in consumer spending with something as simple as an in-store promotion. According to the NRF, 41.4% of back to school shoppers are influenced by in-store promotions. So if each of those shoppers spends $688 (also according to the NRF), that’s over $12 billion dollars of back to school spending that’s been influenced by something as simple as an in-store promotion. Not that back to school promotions are simple. For over a decade, back to school marketing campaigns have gotten more intricate, complicated and data-driven thanks to reporting that online and mobile technology has enabled. It doesn’t stop there. Take Office depot – Their 2013 back-to-school promotion includes all the regular tactics – digital ads, website content, video, etc. They also took their campaign to another level, partnering with British boy band, One Direction to deliver a message against bullying and sponsoring their North American summer tour. Office Depot is also releasing a line of school supplies featuring One Direction with an anti-bullying messaging to bring their back to school campaign full circle. 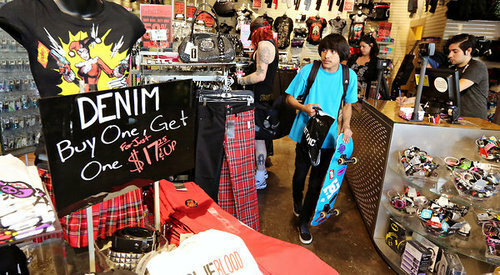 As back to school campaigns get more robust, the in-store promotions that go with them get more and more important. With the right promotions, a back-to-school campaign gets the best chance to succeed. They connect the brand to the product at-retail, and give shoppers the right incentive to buy. In case you’re wondering, incentives are a necessity. According to Experian, back to school shoppers are still price sensitive due to economic uncertainty, and the NRF says 51.1% of shoppers are shopping for sales more often because of it. Let’s say you did everything right. You launched a robust and engaging marketing campaign that gets the heart of what your target cares about, and what they love, made sure to hit all the right touch points throughout the season and get your customer in the store to buy your product. What’s the worst that could happen? Well, your product could be out of stock, or even worse, your product could be readily available, but nowhere to be found. Then there’s always the possibility that a retail associate put a competitor’s product in the back-to-school display you bought. There goes all the hard work, dollars and planning down the drain. While there have been amazing advances in marketing technology, and though shoppers are starting to buy more of their products online, Brick and mortar stores are still where most back-to-school shopping happens. Only 40% of back to school shoppers plan to do any of their shopping online. Since price and promotions factor so much in back to school shopper’s decisions, can you afford to leave your in-store promotions to chance? Request a demo and we’ll help you guarantee nothing gets in the way of your back to school campaigns and the sale.